We are currently putting together our e-commerce shop. Please check back to purchase parts online. Roseann and the late Jerry VanAlstine started a heavy duty truck and trailer business with $500 in parts inventory, located in the basement of their home. After many years of dedication, VanAlstine Truck, is happy to say, we can now supply all of your parts, repairs & rebuilding needs. 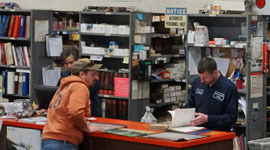 We are an authorized dealer for Cummins, Detroit Diesel, Allison, Aurora Pars & many more lines. 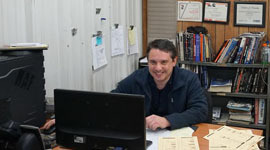 We carry a variety of parts for all heavy duty truck's and trailer's. Our Heavy Duty Truck & Trailer Service department is dedicated to keeping your truck and trailer on the road because you are important to us. We also added on a complete machine shop, that can meet all of your engine rebuilding needs. 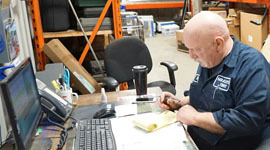 Our ASE certified engine machinist's guarantee clean, quality work, in a timely manner. Our family now includes 19 employees with a goal of serving you; giving our customers high quality merchandise. Please contact us, we would like to get to know you better. We would appreciate your comments and any suggestions you might have. Thank your for taking the time to read about us, if you have any questions, don't hesitate to ask.